Grilling is one of the famous forms of cooking which is loved by most people. Prudential Hotel presents “Australian Wagyu & Seafood BBQ Fest” Dinner Buffet, featuring a variety of grilled specialties, you can dive into the indulgence of Australian Wagyu, New Zealand Lamb, Mongolian Marinated Chicken, Roasted Alaska Clam Provencale and Roasted Alaska Clam with Garlic. Also, don’t miss the unlimited supply of New Zealand Oysters, Canadian Snow Crab Leg and Diamond Shell Clam! Chef Recommendations: Canadian Snow Crab Leg, New Zealand Oysters, Blue Mussels Soak with Basil, Diamond Shell Clam, Chilled Prawn with Cocktail Sauce, Assorted Sashimi, Seared Salmon Tataki, Peufs Sur Le Pla. Exquisite Delicacies: Pan-seared Duck Foie Gras with Baguette and Balsamic, Braised Angle Hair with Slipper Lobster and Rich Cheese, Sautéed Crab with Thai Chili Sauce, Baked Duck Liver Moussaka, Herbs Roasted Canada OP Rib, BBP Station with Sichuan Pepper Roasted New Zealand Lamb, Mongolian Marinated Chicken, Rich Garlic Roasted Australian Wagyu, Roasted Alaska Clam Provencale, Roasted Alaska Clam with Garlic. Sweet Temptations: Snow Pear with Fungus and Fritillaria Cirrhosa, Ice cream and Fresh Fruit Pancake, Fresh Fruit Tart, Mango & Chestnut Cream Cake, French Crème Brûlée, Hokkaido Milk Pudding, Mini Portuguese Egg Tart, Swiss Mövenpick Ice Cream & Häagen-Dazs Ice Cream. *Specialties of the buffet are served on rotation basis. *10% service charge on original price. "Like" our Facebook Fan Page or "Follow" Instagram: prudentialhotel: on Monday to Thursday (weekday) discount will be offered to 30%, Friday to Sunday & public holiday eve offered to 25%. 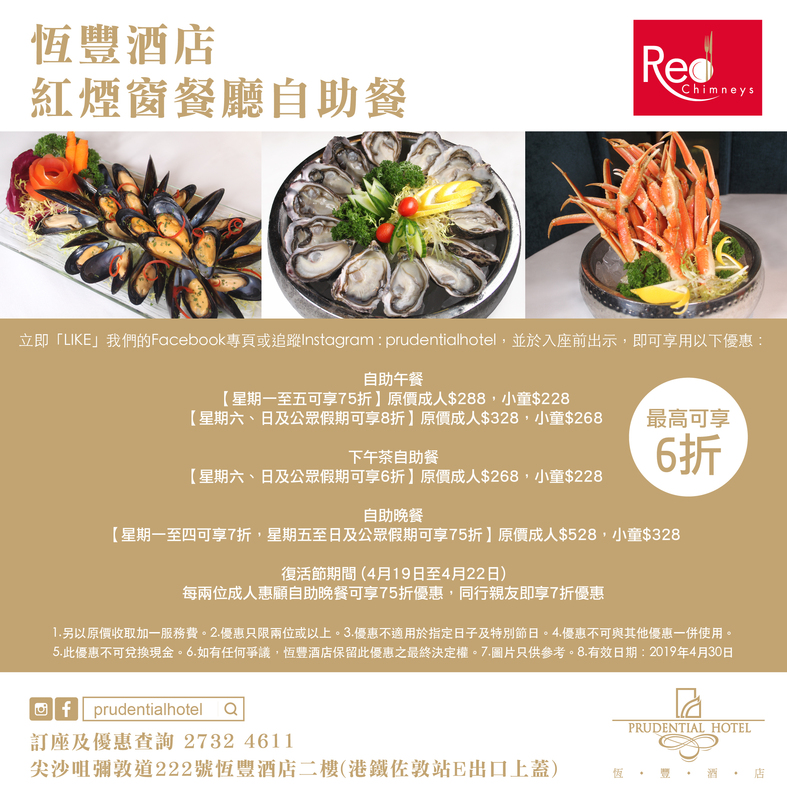 During Easter Holidays (from April 19, 2019 to April 22, 2019), 30% discount will be offered to accompany guests upon dining with two guests paying patrons with 25% off discount on Dinner Buffet.